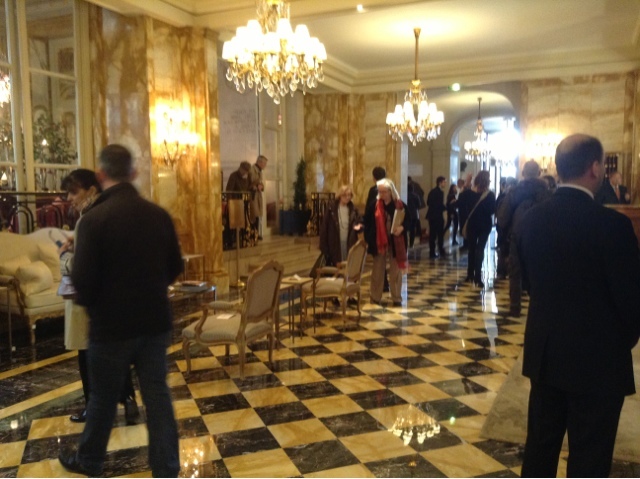 Last Friday I went/ran to the first day viewing at the Hotel Crillon of 3,500 auction sale items. I thought there would be lines round the block. Not so. Mostly serious buyers taking detailed notes. The fun of going to an auction is you can get close to the objects and even pick them up to examine for your possible future purchases. 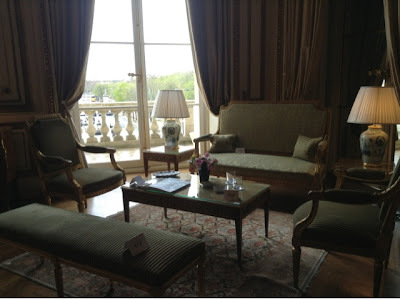 At the Crillon there were velvet ropes. Small items were safely inside glass cases. But still you could pretend you were staying there. 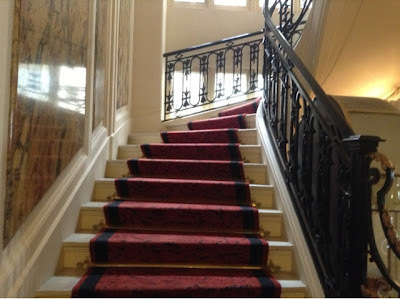 You start out by going up the stairs 'to see your room'. 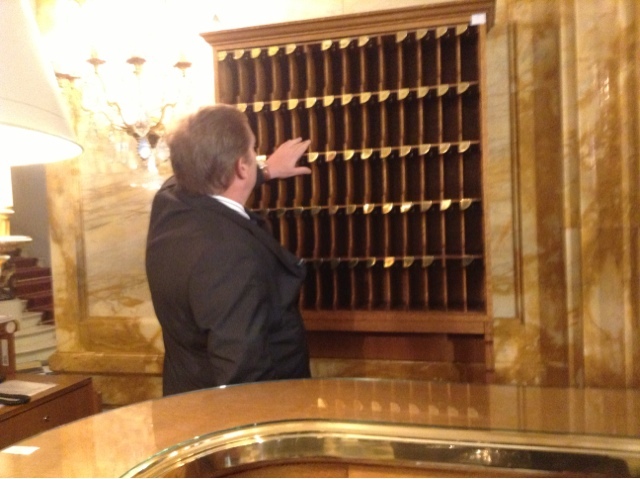 On the way up you passed cases holding Hotel Crillon breakfast china from Bernardout and signature silverware. 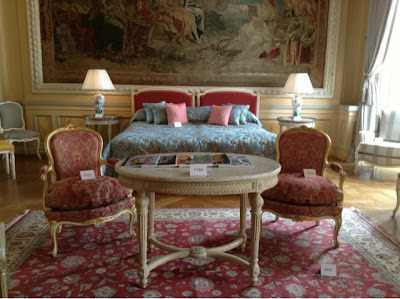 Wouldn't it be nice to have your own Hotel Crillon room service breakfast table? And why not buy the whole bedroom set while you're bidding at the auction? An inherent ambience of another time. The Hotel Crillon was built in 1758 and went through many transformations before becoming a hotel in 1909 with 143 rooms and 44 suites. Many historic signings took place there during WWI and WWII. The front desk receptionist was onhand and much sought after for interviews by all the TV stations present. He must have many good stories to tell. 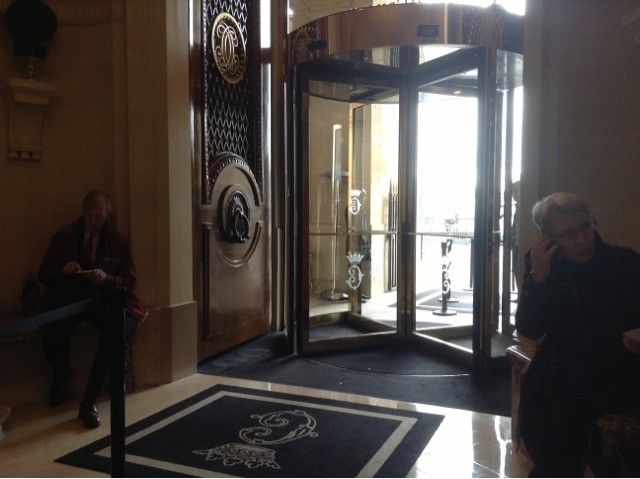 Post-auction Hotel Crillon will be completely rennovated and reopen in Spring of 2014. The rooms looked simply gorgeous. Everyone else was checking price lists and I was admiring the light..
Are you returning to bid on anything? My days of acquiring tchotchkes are over. I like seeing the hotel. 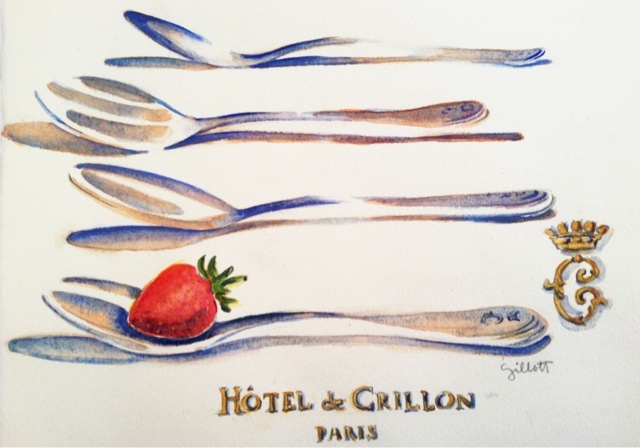 I absolutely loved your drawing of the silverware w/ the strawberry. Was that your composition/idea for the painting? The Crillon should have had it as their branding. It speaks volumes: class, luxury, yet enticing and seductive (the strawberry). I love your work anyway but this one painting seemed to project all about the Crillon. I used to be crazy about painting spoons. Would have loved that. Thanks for the peek, hadn't heard about it. 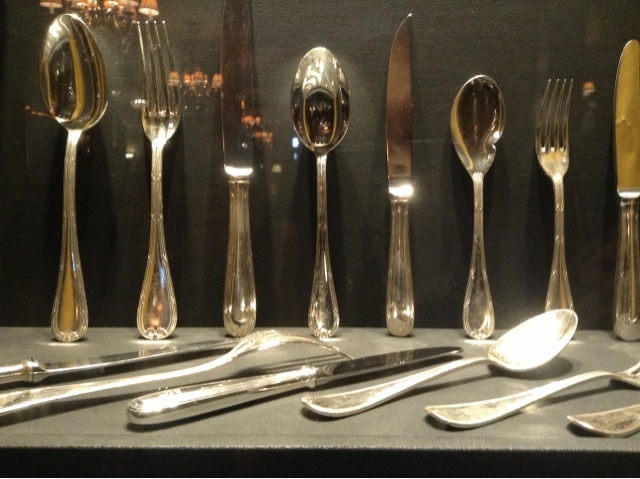 You're so good at showing light....the cutlery is spot on perfect love it..the crown..:) the C..C'est magnifique. Oh lala what luxury there Carol! Love that painting of yours, Carol. Gosh, just the thought of an auction has my nose twitching. Can you imagine making a big bid mistake on the nose in a place like that? Crivens. It doesn't work like that. You have a numbered paddle you raise when you bid. 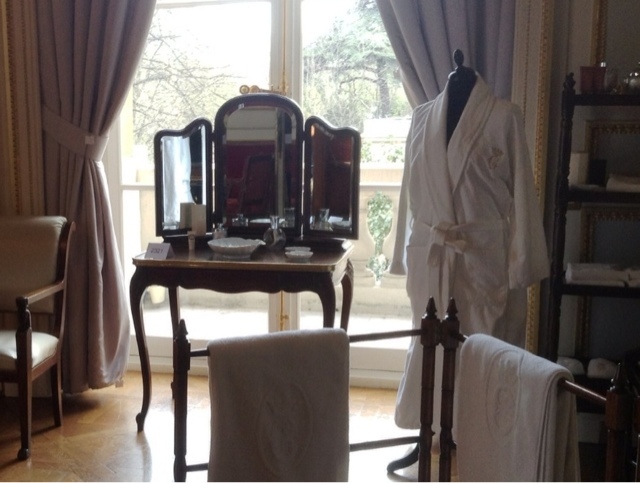 I've always had a passion for Hotel Silver (available at Bergdorf)…and of course a deep passion for the Crillon. 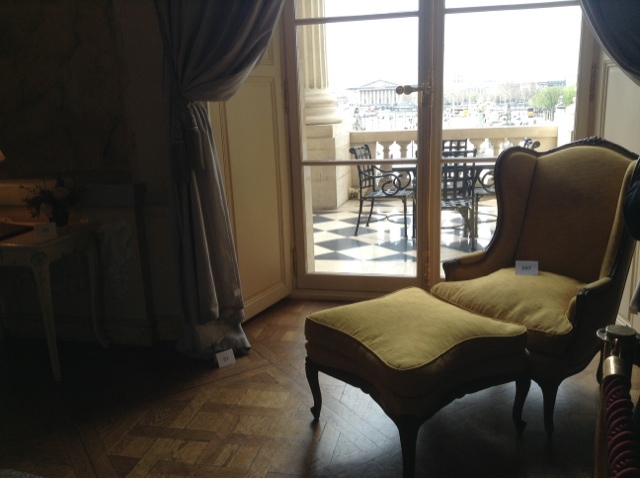 How I wish I was there in Paris for the auction. Alas, it's impossible. 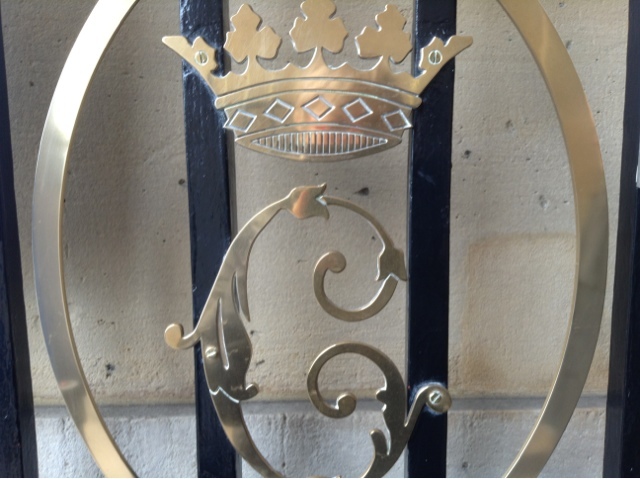 Just a set of teaspoons…or a tray…or anything with their logo. If only someone (you?) will purchase some items and offer them for resale??? Of course, I must add that I love/admire your marvelous postings. I wouldn't have a clue how to do that Helen. It's not my area of expertise at all. So luxurious, what beautiful furnishings, I'd love to have stayed there, lucky you. 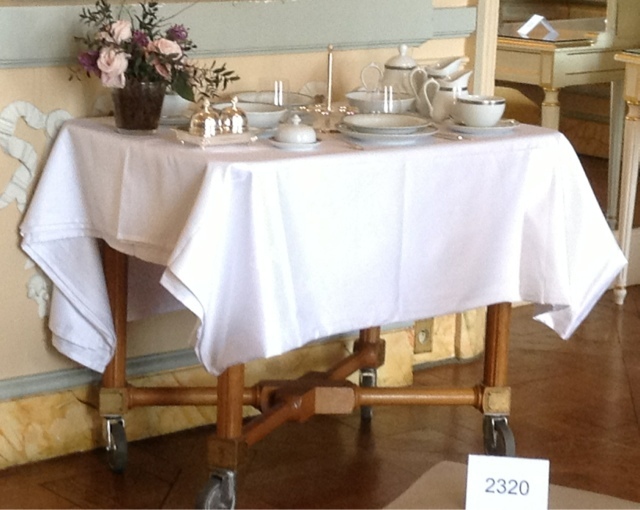 Your painting of the spoons would be a lovely souveneer for someone who had stayed there. Thank you for your nice comment on my anniversary blog post. 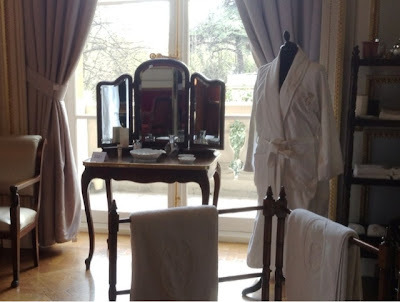 Clearly, I must cancel my trip to Paris tomorrow so that I can arrange to stay at the Crillon! And extend it to at least 3 months so I can soak in the ambience. Till then I will be content looking at that wonderful silverware painting! Carol,that beautiful painting and all those wonderful pictures just gave me the happiest reason to revisit the Crillon and our happy memories there. What an amazing place! Great photos & sketch, Carol. Spring is pretty gorgeous on its own. great pics, what atmosphere. And a remodel to only top that...hope so. This brings back a flood of memories working at the Crillon as a Pastry Stagiare! Fun times (and I remember that cutlery all too well!) 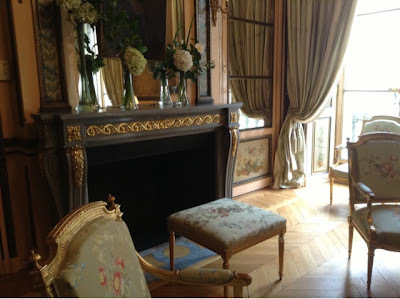 Timeless Beauty and Elegantly French ~ loved seeing this and love your painting! ❤J'adore Paris!